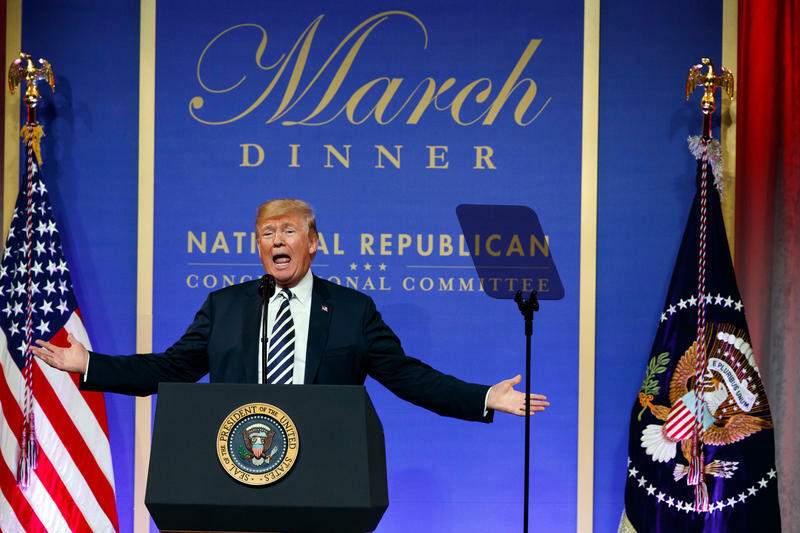 In this March 20, 2018 photo, President Donald Trump speaks to the National Republican Congressional Committee March Dinner at the National Building Museum in Washington. Judy Meyer is executive editor of the Sun Journal, Kennebec Journal and Morning Sentinel:"Collectively, across this country, journalists need to stand up and speak for themselves, and for the people they represent through their work," says Judy Meyer, executive editor of the Sun Journal in Lewiston. "So, we're happy to do that." The Bangor Daily News also participated. Its editorial page editor Susan Young says journalists serve the public by holding officials in power accountable. "Without some of the reporting we've done recently we wouldn't know that the Maine Department of Health and Human Services has misspent over $13 million of TANF [Temporary Assistance for Needy Families] funds, or that the public health nursing ranks have been decimated, and despite bills requiring that he do so, the governor has not allowed the department to hire more nurses," Young says. Greg Kesich of the Portland Press Herald says Gov. Paul LePage's response to the media mirrors President Trump's approach. "I think that's kind of par for the course if you're a journalist and you cover politics - the people you write about are often not happy because you don't just take they're point of view," Kesich says. Kesich says the president's approach can diminish the impact of a free press, "which might serve his interests in the very short term but is not good for the country because we really need a free and independent press to be able to check and verify the information that comes out of the government. And I think that's why you're seeing this national response from these editorial boards: What are we going to do? How do we preserve this key part of our democracy?" Kesich's employer, the Portland Press Herald, and the other Maine papers joined with some of the nation's largest, including The New York Times, The Dallas Morning News, The Denver Post, and the Chicago Sun-Times, which in print today are challenging the president's assertion that mainstream journalists are producing fake news. Originally published Aug.15, 2018 3:13 p.m. Updated Aug. 16 11:25 a.m.